← Who’s responsible for this mess? Ordinarily, I’m fairly conservative in how I behave in public, but Saturday, I acted so very childish, and I have the boo-boo to prove it. Saturday was the first time this year I’ve seen five of my grandchildren. Initially, we were going to the barn so they could ride my horses, but I ended up taking four of the five to Atlanta’s version of Central Park. 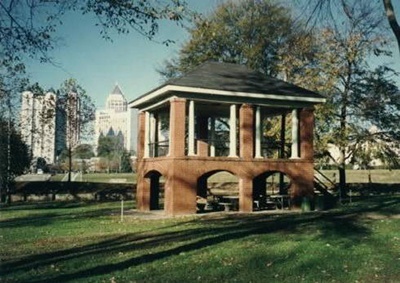 The Atlanta skyline looms large over Piedmont Park. From Piedmont Park, you can see part of Atlanta’s skyline. People flock to the triangular park for its tennis courts; basketball courts; and fields for football and the other football (soccer), volleyball, softball and other sports played with balls. Oh, and the runners and cyclists traverse the roads and the tracks around the fields. Oh, oh, and the weddings (we saw two while there, and the kids kept asking, “Did they kiss yet?”). The park has a pool and several ponds, the latter drawing people who want to feed the ducks and geese, and catch whatever lives in the green water. And then, there’s the playground, which is why we ventured there. and the golf carts that we couldn’t ride because they weren’t ours. Ultimately, we found the playground, with flooring made of rubberized mulch and enough stations so that no child had to wait long to get on a sought-after apparatus. I soon discovered I had a great challenge in keeping four children in my sights. One wanted to swing, another to climb the rope wall, another to get on the self-powered rotating stick thingy, and the other one to just simply disappear from view. Good thing they wore bright colors. While pushing one on the swing and teaching another how to swing, one of them noticed a girl with her face painted in even brighter colors. Yes, I told her, they could get their faces painted. The face-paint artist sat strategically on the periphery of the playground on a bench; the girl we had seen was her daughter. Was I totally childish in having my face painted? 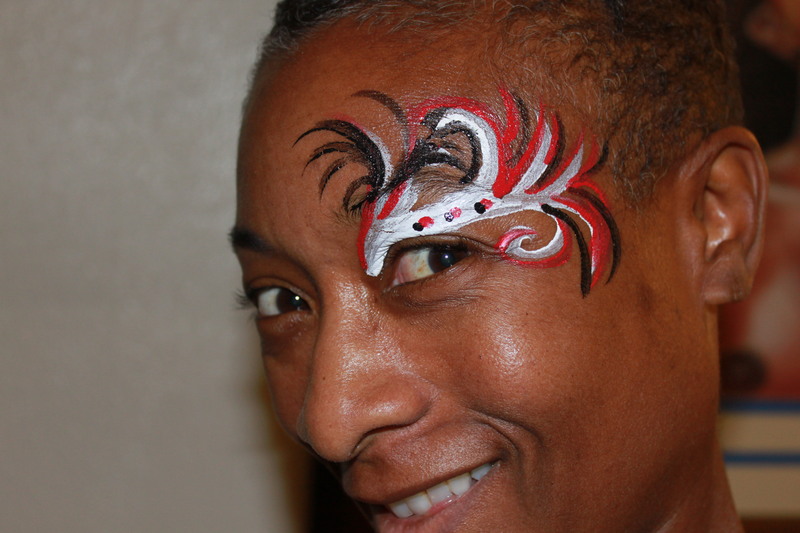 I felt like being childish, so I allowed the woman to paint red, white and black swirls around my left eye. I’m not sure why she told me two or three times while painting my face that she also does full-body painting. As they strutted around the playground, the kids were much easier to spot with their newly painted faces. Soon, we left the playground to explore other parts of the park. I challenged them to several races: up the stairs, to the large bush, up and then down some other stairs. Of course, I let them win. Then, we were off to climb trees and play at the edge of the pond. I was able to hoist each one onto a limb, where they stayed long enough to take a few pictures before the younger two insisted on getting down so they could play in the dirt. The other two scooted along the horizontal branches. Literally, out on a limb. About 20 minutes later, we were headed back to my big honkin’ truck, stopping by the gazebo and watching men with homemade fishing poles trying to catch … turtles. No one succeeded while we were there, but the turtles seemed to enjoy the food. I’m sure the kids slept well after the walk in the park. As soon as I got home, I took a long, hot shower to soothe my aching being. I was going to say “body,” but my whole being was exhausted. Later, I discovered my boo-boo. A bruise on my thigh, apparently appearing when my thigh collided with the branch. That bruise is my badge of honor for acting childish. Welcome to New Hampshire. Where’s your coat?